service is normally priced at $210, a $141 savings! TRUST, Inc. wins and you win too! 100% of your $69 goes to support TRUST. Contact TRUST at 612-827-6159 or trust@trustinc.org for ticket. 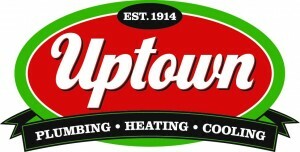 Servicing customers since 1914, Uptown Plumbing, Heating & Cooling offers expert technicians that service furnaces, boilers, and cooling systems. Uptown is a six-time Angie’s List Super Service Award winner and has earned an A+ rating with the Better Business Bureau. What do you get for your $69? The Center for Disease Control recommends tune-ups and safety checks annually. One in five heating systems have a safety issue that could cause carbon monoxide poisoning. Carbon monoxide is a colorless, odorless gas and it causes more than 20,000 emergency room visits annually. A tune-up and safety check will ensure your home’s heating and cooling systems are operating safely, efficiently, and reliably all winter long. Simple maintenance can save you money! If you haven’t had your furnace or A/C tuned up in the last 3 years, you could be consuming 5-10% more energy than needed. Prevent costly repairs – avoid your system failing while you’re not home.